ST. GEORGE — Hurricane made its bid to escape from the middle of the Region 9 pack, while Dixie improved to 6-1 to snuggle up next to first place Pine View, which is 6-0 after a bye on Friday. And Snow Canyon became the last team to break into the win column with an easy victory over Canyon View. 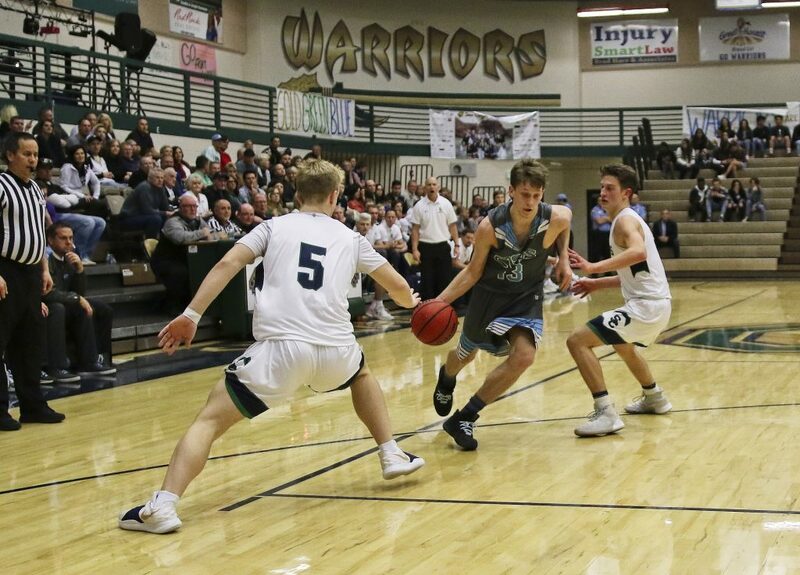 The Snow Canyon Warriors got their first region win of the season, easily defeating the Canyon View Falcons. 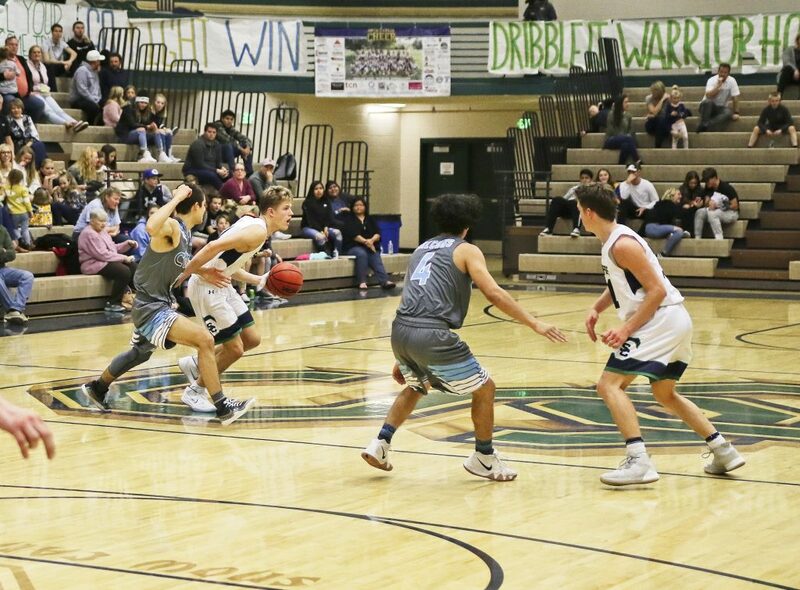 Snow Canyon raced out to an early advantage at home, leading by 10 after one quarter before blowing the game open in the second and holding a 22-point lead at the halftime break. The game was much of the same in the second half, with the Warriors offense unleashing 33 more points, cruising to a 19-point victory. 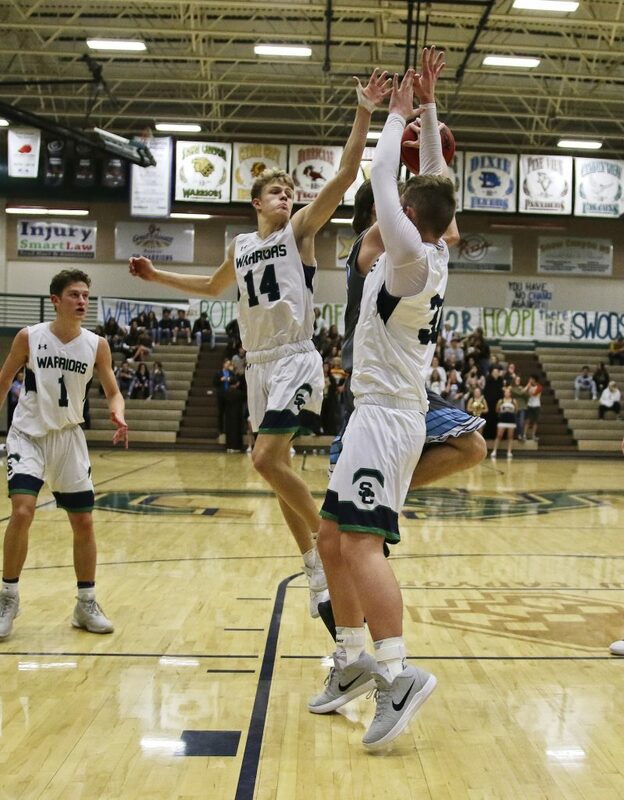 Snow Canyon improved to 1-6 in region, while Canyon View drops to 3-4. Joey Robertson was the star for the Warriors, dropping 22 points. 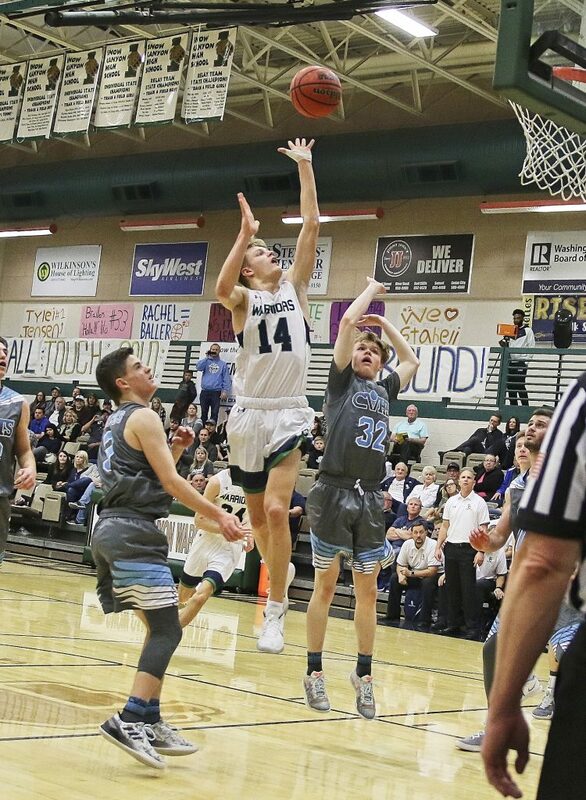 Cole Warner added 19 for Snow Canyon. Mason Lyman led the way for the Falcons, scoring 18 points, while Dallyn Brindley added 17. 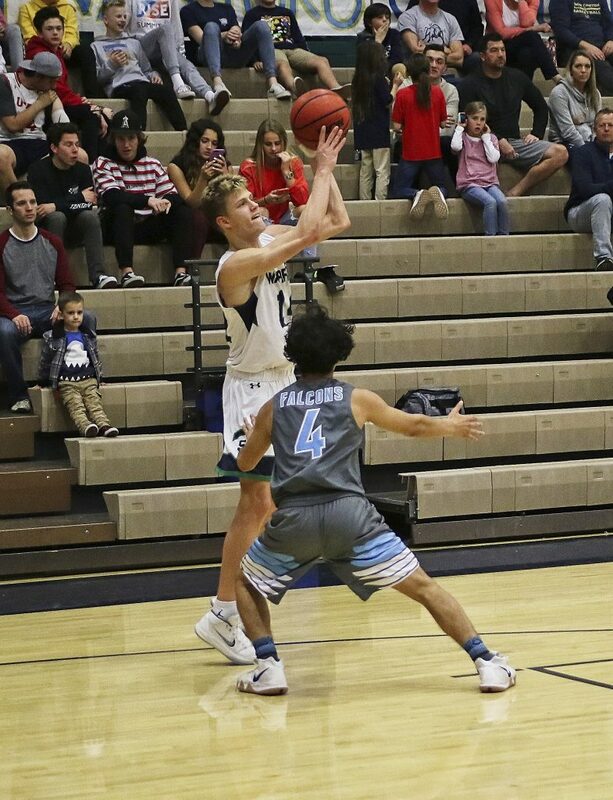 Snow Canyon will travel to Pine View Wednesday to take on the first-place Panthers at 7 p.m.
Canyon View hosts Hurricane on Wednesday at 7 p.m.
At Hurricane, the Tigers used a 22-8 run during the third quarter to pull away from the Desert Hills Thunder. That 14-point difference ended up being the final margin in Hurricane’s 58-44 victory. Hurricane led 16-13 after one quarter, but the Thunder rallied to tie the score at 26-26 at halftime. As the second half began, the Tigers switched defensive schemes to help spark their decisive third-quarter run. The Tigers finished the game with three players in double figures, led by Bryce Thomas, who had 15 points and 5 steals. Dom Scott added 14 points and grabbed a team-high 8 rebounds, while Dallin Davis contributed 13 points for Hurricane. 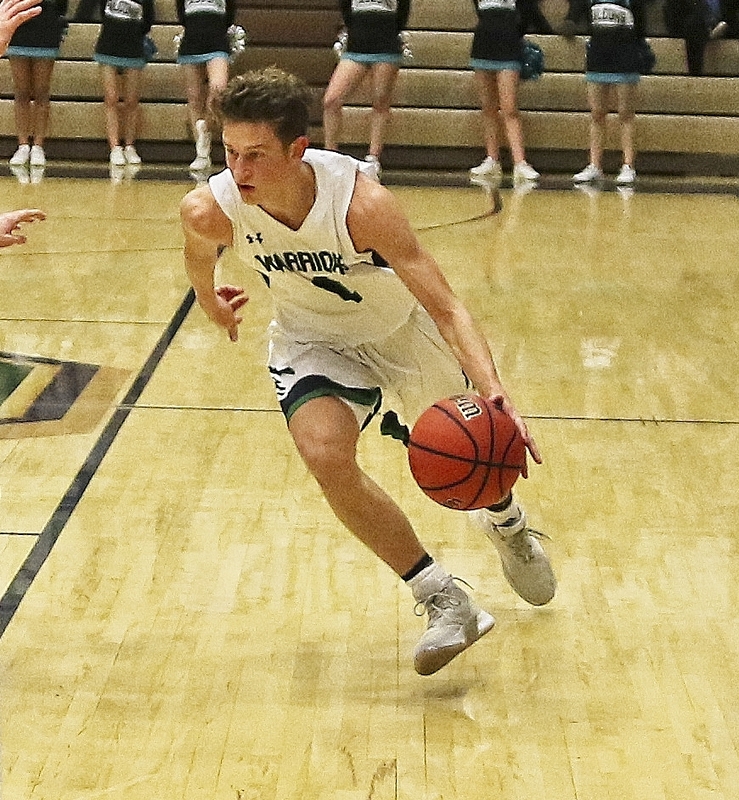 Carson Thornton led Desert Hills in scoring with 12 points, while Keegan Munson added 9. The Thunder were a collective 3-of-18 from 3-point range. Hurricane improved to 4-3 in Region 9 play and moved into sole possession of third place in the region standings. Hurricane trails only undefeated Pine View, which was idle on Friday, and second-place Dixie, which beat Cedar Friday night to improve to 6-1. “We’re starting to play better as a team,” Langston said. The Hurricane Tigers play at Canyon View Wednesday at 7 p.m., while Desert Hills will host Cedar that same evening. The Dixie Flyers throttled the Cedar Redmen, improving to 6-1 in Region 9 play. Holding just a one-point lead after the first quarter, Dixie outscored Cedar 20-8 in the second, taking a 13-point advantage into halftime. After another 20-point quarter in the third, the Flyers cruised the rest of the way for an easy win. “We had a slow start but once we got rolling things just clicked and guys played together and were unselfish,” Flyers coach Tyler Roberts said. Isaac Finlinson led the way for Dixie, scoring 15 points while hitting three 3-pointers. Ethan Bennett and Hayden Cottle each added 11 points for the Flyers, while Jordan Mathews chipped in 10. For Cedar, Treyton Tebbs scored 14, while Zab Santana added 12. The Redmen dropped to 1-6 in region play. 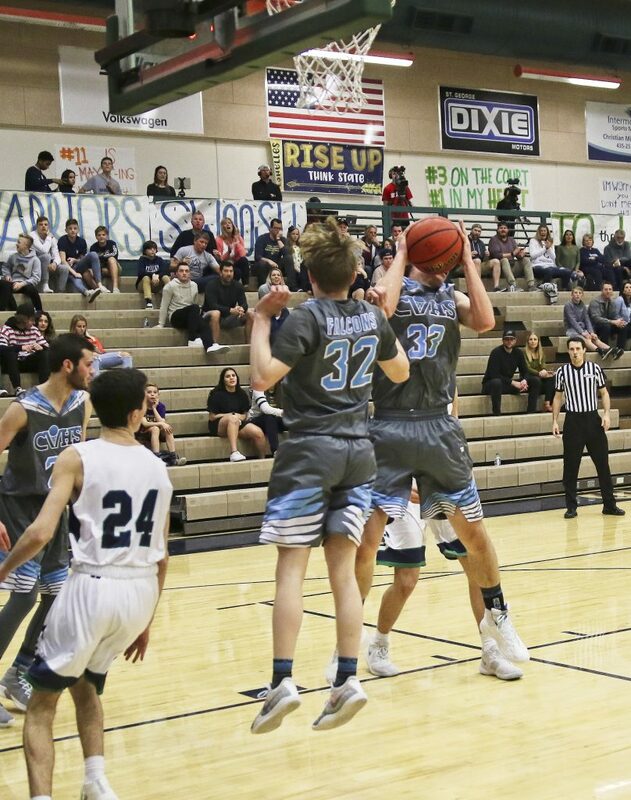 After a bye on Tuesday, Dixie will play at Snow Canyon on Friday at 7 p.m.
Cedar will travel to Desert Hills on Wednesday. Tipoff is set for 7 p.m.